An invasion is underway across the United States, and worried local officials are sounding the alarm before the incursion hits home. Two species of non-native freshwater mollusks — commonly called quagga and the lesser-known zebra mussels — have been marching their way across the country infesting U.S. waterways since the late 1980s, hitchhiking on the hulls and motor sections of recreational boats. Believed to have been introduced through ballast water discharged from ocean-going ships, these exotic freshwater bivalve mollusks — relatives of clams and oysters — have spread rapidly since their initial discovery, first throughout the Great Lakes, then advancing to a number of waterways throughout the eastern and central U.S., and are now finding homes in Southern California lakes and reservoirs. Invasive species are of great concern to fishery biologists. 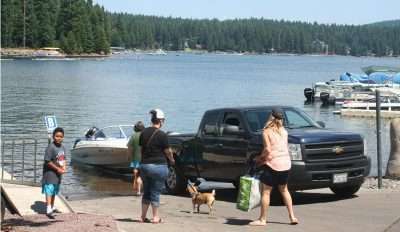 The Plumas County Sheriff’s Office and PG&E, owner of Lake Almanor, are uneasy that the invasive species might find their way into the waters of that lake, which sees several thousand boats enter its waters throughout the year, particularly during the summer tourist season. State and federal agencies have joined forces to avert further infestations of quagga mussels and are urging boaters to stay alert to help stop the spread of the alien mollusks. These agencies, along with local authorities and other stakeholders, seek to coordinate efforts to prevent harmful, invasive quagga and zebra mussels from further infesting the state’s waterways in rural and urban environments. Non-native quagga and zebra mussels wreak havoc wherever they appear, warned CDFW, “by disrupting the natural food chain,” and in large numbers can cause a shift in native species and a disruption of the ecological balance of entire bodies of water. If left unchecked, the mollusks potentially pose a serious economic threat to California fisheries. So far, quagga mussels have contaminated at least 39 waterways and lakes in Southern California, according to state officials; places like Lake Havasu, Lake Piru, Pyramid Lake, the Colorado River Aqueduct and Colorado River at Imperial Dam, including numerous California reservoirs such as San Diego County’s San Vicente Reservoir, for example, all currently heavily infested. As quagga mussel larva mature, they are often drawn into boat engines, cover steering components, and form encrustations on docks, ramps and other marina facilities. They damage boat motors, and litter beaches with sharp, foul smelling shells. Furthermore, the mollusks negatively impact fisheries; recreational activities, including sport fishing; threaten water delivery systems; and interfere in the function of hydroelectric facilities by clogging cooling systems, where the mussels obstruct intake valves by the thousands. The infestation of quagga and zebra mussels nationwide has already had an economic impact on states costing billions of dollars in eradication efforts. About a half-inch in size, the quagga mussel can live at the water’s surface to a depth of up to 200 feet, and can survive as long as three to five days out of water depending upon temperature and humidity during the summer months, and up to 30 days in the winter. Unfortunately, because they reproduce quickly and in large numbers, once established eradication is extremely difficult. Their establishment in Lake Almanor and other nearby waterways and lakes pose a serious threat and could result in an environmental and economic disaster for the region. 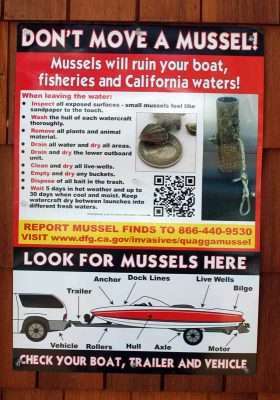 The Plumas County Fish & Game Commission, a citizen-advisory committee appointed by the Plumas County Board of Supervisors, has been working to educate the public on the prevention of quagga mussels from entering into Plumas County waterways. Each supervisor appoints two individuals from each district to the commission. The commission members appointed by Supervisor Sherrie Thrall for Lake Almanor in District 3 are Jim Pleau and John Crotty. Crotty is also president of the Almanor Fishing Association. One of the primary tasks of the commission, which meets once a month in Quincy, is to periodically obtain information from PG&E (and other stakeholders) regarding ongoing preventative measures to keep mussels from finding their way into the lake and surrounding watershed, while keeping the Board of Supervisors updated. Crotty, owner of the Quail Lodge Lake Almanor in Canyon Dam, said he has been an outdoorsman and fishing guide for a number of years, and is therefore committed to helping protect the waterways in the area by supporting the Commission’s mission to help preserve the pristine conditions of the lakes and streams for future generations. In his role with the commission, Crotty expressed how important it is for owners to check for mussels when they transport their boats from infected areas, particularly before launching their sea craft into the waters of Lake Almanor. The Plumas County Sheriff’s Office, through the Plumas County Sheriff Boating Unit, in concert with PG&E, is taking an active role in education and prevention efforts, and is currently engaged in spearheading an active outreach effort to warn boaters to carefully check boat hulls and motors for mussels before they enter lake waters to avoid the potential risk of quagga mussels being introduced into the county’s waterways. 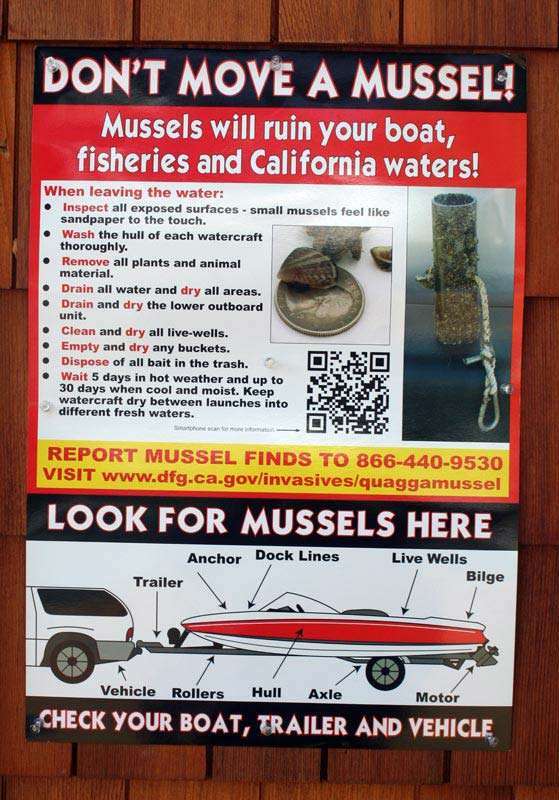 Educational posters provided by CDFW have been placed in high-use recreational areas, with specific prevention and mussel eradication information at local commercial marinas, campgrounds, boat ramps, homeowner associations and other locations. By law, recreational boat owners who boat in any bodies of fresh water in California are assessed a $16 fee biannually along with their boat registration, and must display the “Mussel Fee Paid” sticker next to the registration sticker on their boats. Boat owners are also required to manage their recreational boating activities through voluntary inspection and decontamination of any mollusks that have attached themselves to their vessels, waiting for an opportunity to be introduced elsewhere. Boaters should anticipate that officials might also be present at launch ramps to inspect their watercraft. Paul Moreno, PG&E corporate relations officer, said PG&E is working to prevent infiltration as part of the company’s Pacific Gas and Electric Company Quagga and Zebra Mussel Infestation Prevention Program. A number of important steps are being taken by the company in its plans to prevent mussels from entering Lake Almanor. He said that PG&E has provided training to its hydro operations and maintenance staff on preventative measures against the spread of quagga and zebra mussels. In addition, PG&E has information online about these invasive species and measures to prevent their spread. 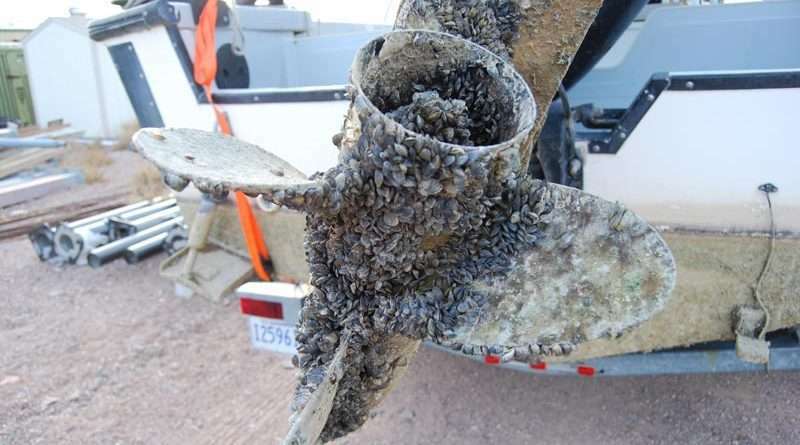 Marine craft owners should take the opportunity to review the company’s webpage for important tips on inspecting and removing these unwanted mollusks from their boats. Moreno said that PG&E monitors the waters of Lake Almanor during the summer months (May-October) when the mussels, if present, would be most active. To date, there are no signs of the pesky mollusks in the waters of Lake Almanor, Moreno noted, but the monitoring program continues, employing methods provided by CDFW. Monitoring methods include surface surveys in areas that include flotation docks, buoys, mooring lines, rocks, logs and driftwood, vegetation and anything else that has been in the water for a long time. Veliger monitoring takes samples of small organisms that may include the larva of bivalve mollusks that are collected by pulling a fine-mesh net through the water column. The collected samples are then sent to the CDFW laboratory in Bodega Bay and analyzed for the presence of non-native species. Also employed is artificial substrate monitoring that involves using plates that are deployed at various locations in the lake and inspected during each visit for any mussels that may have become attached. Ignoring the threat of infiltration could be a very expensive mistake, county officials warned, since mussels have few or no natural enemies, and once they get into a lake or stream, they easily take over. In California, it is illegal to transport or possess live or dead quagga or zebra mussels, including water that may contain their microscopic larvae. According to information provided by David Hollister, district attorney for the Plumas County District Attorney’s Office, and Boating Deputy Bob Orange, a boat owner a couple of years ago left the infested waters of Lake Powell, a reservoir on the Colorado River, and drove to the border of California where he was stopped after inspectors discovered his boat was encrusted with quagga mussels. Despite a requirement to pressure wash his boat with hot water to remove the visible mussels, he was nevertheless tagged, prohibiting entry into California. The owner decided to make a runaround via Truckee, intending to arrive at Lake Almanor where he planned to launch his boat undetected near Big Cove Resort. Although he had removed his tags, concerned citizens who had observed the mussels remaining on his boat while the owner was getting gas alerted California authorities after he mentioned to them that he was heading to Lake Almanor. CDFW then called the sheriff’s office and a PCSO patrol boat responded with a warden, who subsequently quarantined the boat. He was later formally charged with two misdemeanors: possessing, importing or transporting quagga mussels; and unlawful importation of fish or wildlife. Fortunately, PG&E tested the waters soon afterward, but found that the lake had not been contaminated. Apparently, the quagga had already died before the boat entered the water. It should be noted that boat owners found guilty of these charges could expect to pay thousands of dollars in fines and legal fees. The state can also file a forfeiture action and have the vessel seized indefinitely. In addition, owners found in violation could serve up to one year in county jail, said Hollister. The perpetrator is currently in warrant status after failing to appear in court, which could later compound penalties when he is finally arrested should he return to California, and may also suffer an increase in potential jail time. Recreational boaters are encouraged to prevent the further spread of aquatic invasive species by following basic cleaning guidelines: Clean, Drain And Dry.